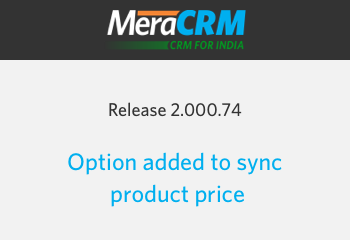 “Everything starts with the customer.” MeraCRM, keeping in mind your needs have come up with a way to to sync your quotations with the product price field. Why? This will help you to link your quotations to the particular “product price” field letting you manage your quotation and products in a better way. To achieve this, you need to make sure that from the ‘Quotation Setting’ has been configured, and so when you update your quotations, if you have checked the ‘Make new revision’ option, it will make an entirely new revision of your quotation and saving the previous one too. All this should be configured before you land into the custom field settings. After the configuration, go to the custom field settings. Here when you create the ‘Product Price’ field, make sure you check the ‘Sync with Quotation’ option. Now you need to decide how you want to save your quotations. One is the ‘Make new Revision’ which when on quotation updating will make an entirely new revision of the quotation and lock the previous one so that in future you can easily view a history of your quotations. With the ‘Update existing one’ option, when you update your quotation, it will be overwritten maintaining a single quotation copy. Also, the newly revised quotation will take its parent quotations’ name adding a ‘-1’ to the new quotation copy. Now you know how many revised quotations you have. Hence, as the tagline of MeraCRM goes “Easy and Flexible to use” the team as tried to prove it with as it’s might.